Turn in for Horde is at the main base, speak with Meredith the Crone. 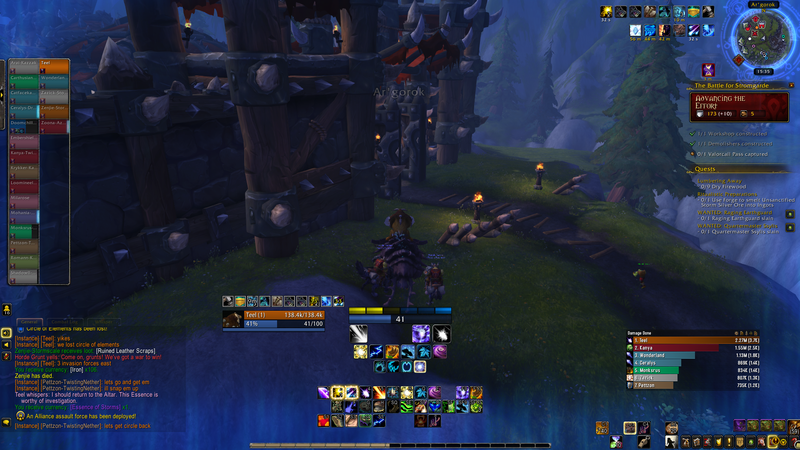 You get a buff from killing any NPC in the warfront, your screen turns blue and get a buff called Bristling with the Essence you turn it in at the Altar of Storms to gain Call of the Storm giving you 150% more Damage and Healing, incresing your health with 150% and giving you 50% movement speed. Stacking this with 4 stacks of Bristling Power will turn you into an absolute machine of war. Damage you deal and healing done increased by 150%, health by 150%, movement speed by 50%. Nearby friendly units deal more damage. Wow thought i was getting something decent "Extremely rare"
Hand it in to Meredith the crone, she is the helmet icon in your starting base. I got this while fighting 3 alliance invasion waves and killing 2 spiders next to them (no idea what gave this item to me). You do not have to loot anything. I automatically looted it by killing mobs. Your screen will shine up like this with blue on the edges. And you see that you gained the item in the chat. Go to the altar of storms in the Horde base and talk to the Undead woman to activate the buff. Sadly, this buff lasts only 5 minutes! So plan when you will get the most out of it. I'd advise using it at the same time as the 4x10% buffs too. Alliance hand-in is Altarite Jesse Taylor at Altar of Kings by the main base (51.4, 80.9). Meredith the Crone location: facing the iron chest at the horde's main hub, she is to the left of the chest. I had to /target because I was unsure what the altar was. She will give you a buff. It did come in handy while fighting. Nothing brightens my day more than seeing "you have been chosen". For anyone wondering, you CAN get this while you're transformed in any way. I was on the back of a chimera when I got mine. Edit to add I also just got one while I was already transformed into a Keeper of the Grove. Doesn't seem very fair for Blizz to do that, but it is what it is. Can this be obtained from the NPC's killed before Bashal'aran is taken? There seems to be a limit of 2 at a time for the darkshore warfront and 1 at a time for the arathi warfront. So when 2 people have their buff from the altar, none more can drop unless they die. it appears to be 100% random, as long as youre with the group killing mobs theres no way to manipulate how to get it, just hope for RNGsus to be on your side. Good luck with your achieves! Extremely rare, found while killing enemies in the warfront. Used to grant yourself unbridled power at the Altar.